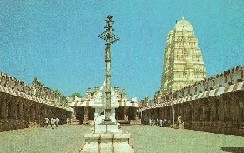 South India is home for several popular temples of India. Temples of South India are built in fascinating Dravidian style. These temples are the gifts of the various mighty dynasties who ruled ancient India in different centuries. Most of these temples are with garbhagrihas, vimanas, mandapas, miniature towers, and pillars. The ancient temples are also evidence to the glorious bygone era. They are not only the religious places of the people, these ancient temples of South India are also living religious institutions where traditions are integrated to the life of people.